There’s been a steady buzz in Atlantic City as the AFL’s Atlantic City Blackjacks moves closer to kicking off their inaugural season with the first home game to be held at James Whelan Boardwalk Hall on May 4. It’s been a busy month for team management as they’ve been steadily signing new players to the roster, hosted a dance team finals at Hard Rock’s Sound Waves theater, where 23 dancers were selected and named the Atlantic City Diamonds, and held open tryouts where more than 100 eager athletes took to the turf in hopes to gain a spot on the new team. The athletes, who ranged from first-timers to experienced players, were tested in various drills, including the 40-yard dash, short shuttle, position-specific drills and one-on-ones. The Arena Football League is a predominately quarterback driven league and with the recent signing of former MVP Quarterback, Randy Hippeard, The Atlantic City Blackjacks are setting the tone as a force to be reckoned with. 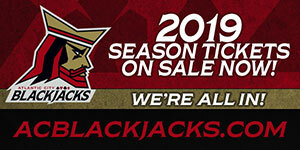 “This is a game changer for the Blackjacks, and we are an immediate playoff contender with this signing” said Chief Operating Officer, George Manias. “In addition, Randy’s presence will attract other top-level players who have not signed, especially the wide receiver and offensive positions. Lastly, Randy is a community guy and will be active in our community as we strive to be Atlantic City’s team.” In Hippeard’s AFL career, he has completed 1,551 passes and has thrown for 18,086 yards with 384 touchdowns. With his veteran knowledge, Randy Hippeard will aid to the success of the Blackjacks in our first season. The Atlantic City Blackjacks went on to sign their first kicker, Mark Lewis. Lewis comes to the Blackjacks from the Baltimore Brigade after receiving the title of Kicker of the Year and First Team All-Arena in 2018. Prior to his time with the Brigade, Lewis kicked for the Tampa Bay Storm under Atlantic City Blackjacks Head Coach, Ron James. Originally from Florida, Mark began as a college soccer player and began playing professional football in 2003. Wide Receiver, LaMark Brown comes to the Blackjacks as a seasoned veteran. 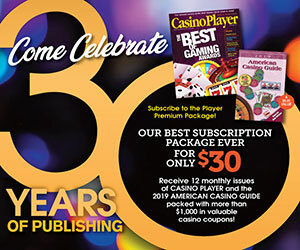 Having played for the National Football League, Canadian Football League, and the Arena Football League, Brown’s experience will contribute to Atlantic City Blackjacks success in the inaugural season. Brown was originally signed as an undrafted free agent with the Atlanta Falcons and played briefly with the Buffalo Bills and Minnesota Vikings in 2012. He made his AFL debut in 2013 with the Utah Blaze as well as spent some time in the Canadian Football League with the Hamilton Tiger-Cats. In this past season, LaMark Brown played for the Baltimore Brigade where he caught nine passes for 51 yards and two touchdowns. The Atlantic City Blackjacks will definitely be making waves this season with the signing of Defensive Lineman, Tyriq McCord. McCord hails from Tampa, Florida where he played football for the University of Miami from 2013 to 2015. Following college, he spent time with the Pittsburgh Steelers in 2016 and the Canadian Football League’s Hamilton Tiger-Cats in 2017. McCord’s experience will make him unstoppable on the Atlantic City Blackjacks’ D-Line! 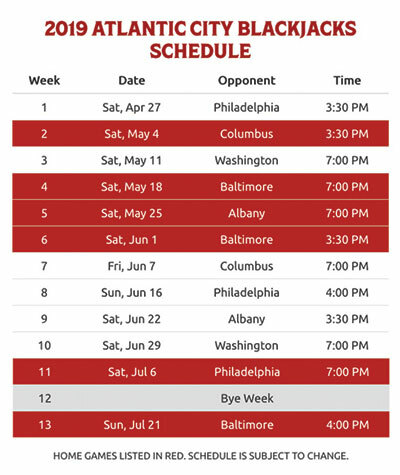 The AC Blackjacks open the season April 27 against the Philadelphia Soul at the Wells Fargo Center and will have their first home game at Jim Whelan Boardwalk Hall on May 4 against the Columbus Destroyers. Both season and individual game tickets for the inaugural season are on sale now. For tickets, contact the Atlantic City Blackjacks sales department at (609) 783-9494 or by going to ACBlackjacks.com. Follow the team on Facebook, Twitter, and Instagram @AFLBlackjacks.